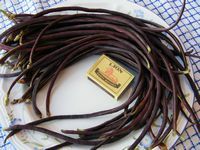 Also called Asparagus bean, Changjiang dou, cheung kung tau. A food plant with the potential to improve nutrition, boost food security, foster rural development and support sustainable land-care. Red Noodle Yard Long Bean is a vigorous climbing annual vine with trifoliate, green, oval and smooth-edged leaves. The flowers are purplish and pods hanging in pairs, begin to form within 60 days after sowing - giving out purple-colored slender pods up to 35-75 cm long. They are shaped like classic beans and have a hint of asparagus-like flavor. Insect and disease free - because of their color they do not attract any insects or pests. The crisp, tender pods are eaten fresh or cooked - it can be cut into short sections for cooking. As a West Indian dish it is stir-fried with potatoes and shrimp and they are used in stir-fries in Chinese cuisine. In Malaysian cuisine they are stir-fried with chilies and shrimp paste (sambal) or used in cooked salads (kerabu). Another popular and healthful option is to chop them into very short sections and fry them in an omelet. The beans/pods are used the same way than a green bean and they are best if picked for vegetable use before when they are young and slender. Yard long beans are quick-growing and daily checking/harvesting is necessary. According to the USDA Nutrient database they are a good source of protein, vitamin A, thiamin, riboflavin, iron, phosphorus, and potassium, and a very good source for vitamin C, folate, magnesium and manganese. In a serving size of 100 grams of yard-long beans there are 47 calories, 0 grams of total fat, 0 mg cholesterol, 4 mg sodium (0% daily value), 8 grams of total carbohydrates (2% daily value), and 3 grams of protein (5% daily value). (Percent daily values are based on a 2000 calorie diet.